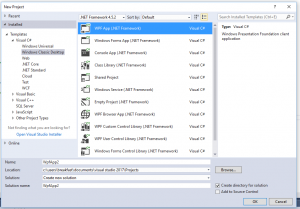 This Post is to help show the steps of installing Visual Studio 2017 community version, and building your first WPF application in ASP.NET C#. These are some basics to learning C#. 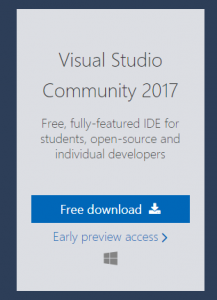 The first step is to go to https://www.visualstudio.com/downloads and download VS 17. Click the Download button, and run once it has installed. When the VS installer loads select the packages you want. For our Install we selected. Install may take awhile and may require a reboot. 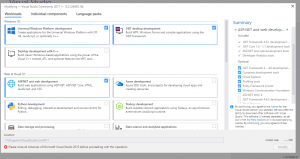 Once you have VS 2017 Installed. 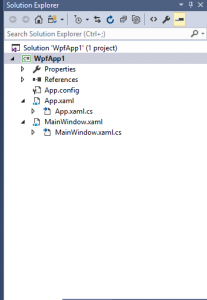 Add a Textbox and a TextBlock to MainWindow. //Update teh Txt block to equal the txtbox text. //Call update txt box when btn is pressed. Click Run Debug and watch the result. Next Next post: Top 4 Single Board Computers you can buy on Amazon, for your next project!